This was a great week. I had a lot of office work, as we are implementing some new Argentina-wide financial changes. This week we had a cool Skype video conference with the SAS (Súdamerica Sur) area accountant and all of the financial secretaries from Argentina. With the changes we're making, it's kept me in the office a little more than I would have liked this week, but just a short transition and then we should be back to normal. Elder Llanos and I were able to find some new investigators this week! 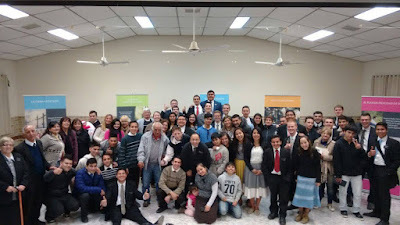 We did a noche de hogar with a member of our ward. She is an abuelita who is the only member in her family, except a few of her grandkids who were baptized but are inactive. We had a great time teaching about how we need to follow God's guide in our life. The member, Hna Guadalupe had asked us beforehand to come and do a noche de hogar, so we were keeping it pretty simple to start out. As we were finishing up, we could tell that some of them were really interested in our message (there were some of the children of Hna Guadalupe, as well as some vecinos...neighbors). We were planning on setting a return appointment so that we could start to teach some of them the lessons, and then, right before we started to wrap up, one of them asks us, Which of all of the churches is true? How can you know which one is right? And that is a golden question, people! As missionaries that has to be one of our favorite questions to hear! 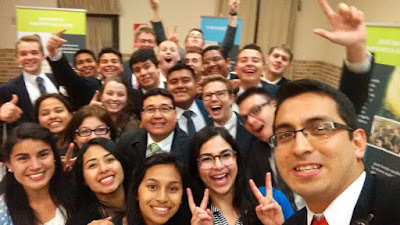 We looked at each other (Elder Llanos and I), because we had already been there for a while, and we try not to stay too long in lessons, but the Spirit was strong, and we felt that it was too good of a moment to lose, so we dove into a quick 10 minute explanation of the Restoration. They listened intently, and afterwards, they still had quite a few doubts, but they want to hear more, and two of them committed to come to church tomorrow! It was an amazing experience. It's one of my favorite things about being a missionary. Sharing the message of the gospel with people, and then seeing them accept it and start to "test the seed of faith", brings a deep and fulfilling joy. I love it. Another great thing, the construction in our capilla is wrapping up, so pretty soon we'll be able to have meetings in our own building again! That will help the church attendance substantially, as many people didn't go because it was so far away. It should be finished in October, and then we have stake conference right at the beginning of November with either an Area or General Authority, and then we're hoping to do a capilla abierta here in the following week! We're pretty excited. As general conference approaches, I began to think of ways that I could prepare myself. It seems that every conference I always commit myself to study the conference talks afterwards, and then before I know it the next conference comes and I still haven't studied half of them. The other day, I came across an article by President Uchtdorf from the September 2011 Ensign called "General Conference- No Ordinary Blessing". I would encourage everyone to read it. We have the opportunity every six months to literally hear what God would have us do in the here and now of the worlds history. Shouldn't that be something worthy of our attention and preparation? I know that if we prepare now, prayerfully seeking to receive guidance from on high, General Conference can be a truly significant and impactful experience, even life-changing. I know that our leaders are chosen specifically by the Lord, and that they have His power and His authority to direct His church and His people. May we always heed their counsel and teachings. "Whether by mine own voice, or by the voice of my servants, it is the same." Have a wonderful, preparation filled week! Elder Orgill came back to the mission after surgery! Elder Orgill so happy to be back in the mission!